Simply enter your name and your phone number. Coffee to go, go, go! Why wait for amazing coffee? 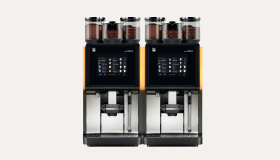 The WMF 5000 S is our speciality machine for those who live life in the fast lane. It perfectly satisfies the need to provide the fullest range of indulgence and finest quality at maximum speed. Ideal for anyone who can’t wait for great coffee specialities. Consequently, the WMF 5000 S has an in-built recipe for success: The more indulgence created per hour, the greater your daily turnover. And that you can count on. 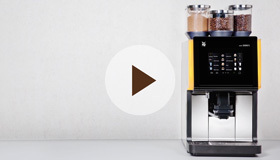 Learn more about the WMF 5000 S in our video. Featuring impressively sleek dimensions. This leaves space available for other coffee machines or add-on equipment. 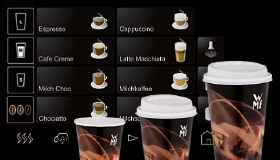 The useful Small-Medium-Large (SML) functions assign different predefined cup volumes to every beverage. The heavy-duty brewer and the high-performance pump guarantee a long service life and top performance. Large touch display with a self-explanatory digital user manual. Automatic display of ongoing processes. Perfectly matching add-on equipment and vending machines for making your work easier and boosting your capacity. Create professional coffee experiences in no time, to your exact preferences, with the WMF milk and steam systems. 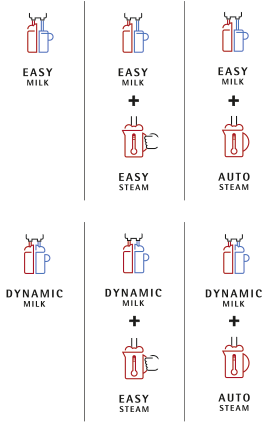 In addition to Easy Milk for hot and cold milkshake beverages, there is also the Dynamic Milk system, which is a fully automatic system for preparing hot and cold milk and milk foam beverages, plus an even wider variety of milk foam consistencies. 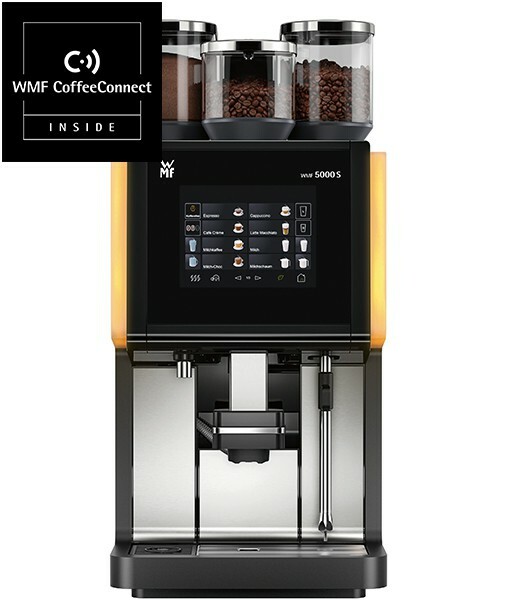 WMF CoffeeConnect as an option. 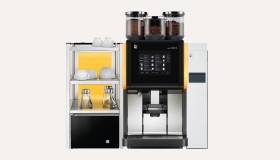 WMF CoffeeConnect provides you with the option to collect valuable machine data. Wherever you are, you can obtain an overview of your sales figures and current service information at any time. You will receive warnings which will let you know if you are running low on consumables or if maintenance is required. What's more, thanks to the system's bidirectional design, you can send tailored promotional offers from your desk directly to the display of a selected machine. The basic functions are available to you free of charge. 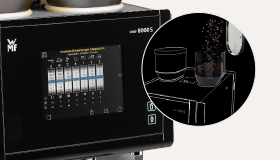 WMF CoffeeConnect collects, analyses and processes data about your coffee machines, enabling you to optimise processes, reduce service costs and boost your sales. * Output is determined using a machine with a constant water supply and is dependent on cup size, quality settings, spout, model and nominal power rating. The recommended maximum daily capacity is based on our catalogued service concept. However, these average values serve merely as a guideline. Let our trained WMF team match the ideal coffee machine design to your specific needs. ** Fully automatic cleaning system using a cleaning tablet and a blue cleaning box. A blue cleaning box with a cleaning tablet is fitted to the coffee machine in place of the milk container and the automatic cleaning program is started. The machine automatically dispenses water into the cleaning box to dissolve the tablet, before automatically cleaning the milk system and rinsing it with water and steam. Once a week, the foamer head must be cleaned manually and soaked in the cleaning fluid. *** The clean-in-place cleaning system essentially works the same way as the Easy Clean system. 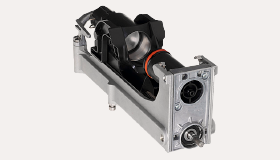 However, the advantage of the clean-in-place system is that the foamer head no longer needs to be removed and cleaned manually as well. **** Height with coffee bean hopper with lock, without key. ***** The A-rated sound pressure levels LpA (slow) and LpA (impulse) at operating personnel work stations are below 70 dB(A) in every operating mode. A WMF water filter needs to be used with a carbonate hardness of 5° dKH and above.